This issue starts up the new status quo for the character; despite this being her first ongoing title, she's already had two previous regular beats, first as a member of the Great Lakes Avengers, then as Danielle Cage's nanny in The New Avengers. Now that those jobs are over, she has decided squatting in an attic, though appropriately squirrelly, is kind of lame, even if it is the attic to the Avenger's Mansion. Time for college, then! 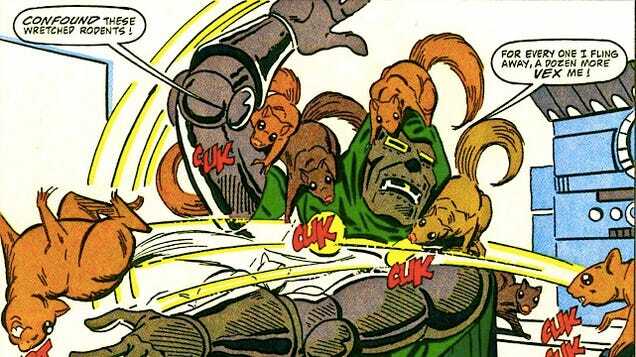 Brian Michael Bendis wrote Squirrel Girl in New Avengers, and it was ... actually kind of icky. Okay, it was nice she got to beat up Wolverine and all, but scenes in which she flirts with Daredevil ... flirting isn't actually the word. Sexually propositions is more accurate. "Squirrel Girl sexually propositions Daredevil (while holding a baby)." is not a sentence that should exist, and now it does. Bendis never got the character; thank God Ryan North is writing this. Here, when she meets an attractive fellow student, her flirting is awkward, as befits a character who is trying to keep her superhero identity secret, literally, because that's what superheroes do in comics. In other words, it acknowledges that while Squirrel Girl is a young adult, and therefore capable of "romance", it also spares us from a sexually aggressive Squirrel Girl making Daredevil very uncomfortable. Fans who follow the character have seen her first kiss; it was cute (and a little awkward). 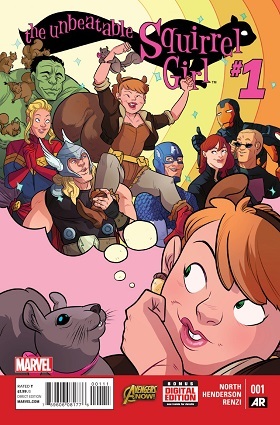 Cute (and a little awkward) is Squirrel Girl's thing, from a "romantic" perspective. Since winning fights well above her pay grade is her thing, from a "superhero" perspective, she wins a fight with Kraven the Hunter, which also sets up the status quo for how these fights are going to work, for the most part. The fight establishes that she is a physically capable fighter, but that her real weapon is her clever use of her squirrelly powers, as well as her ability to understand and empathize with her enemies. She may be the only superhero who fights win/win. One of the things Ryan North brings to The Unbeatable Squirrel Girl is that he is actually a humorous writer. He is best known for the webcomic Dinosaur Comics; that's the one where the same three clip art dinosaurs in the same positions have new dialogue every strip (seems like a better idea than something actually executed, personally). Bendis, obviously, never got the character; Will Murray seemed to just be throwing stuff against a wall to see what stuck when he created the character, and Dan Slott, who reintroduced the character, seemed to waver a bit as to whether you were supposed to laugh with or at Squirrel Girl (and was prone to use her as a mouthpiece when it was "laugh with"). Outside of Fabian Nicieza, who did the aforementioned one-off "First Kiss" story, North is the first writer that seems to be coming at Squirrel Girl from a place of affection. Erica Henderson is also the first female artist to tackle the character, and that does position the comic in a much more feminist frame. For instance, Dan Slott, in one of his "Squirrel Girl as a mouthpiece" moments, had her complain about the fetishization of female superheroes in comic books ("That poor lady! All her insides have been squished into her chest! "), but the impact is lessened a bit when she looks like this. Henderson's new design makes her much more human; it also brings back many elements of Steve "Frikkin'" Ditko's original design which have been underplayed as they distract from the usual comic book embodiment of femininity (i.e. hot). In other words, I really like it. Also, from a furry perspective, how can I complain about her decision to go with fake animal ears? In this issue, Doreen and her new roommate attend a college club fair, but are interrupted by Tippy Toe, who informs Squirrel Girl that none other than Galactus is headed for Earth. The scene where Tippy tries to dramatically jump through a pane of glass only to harmlessly bounce off in order to gain Doreen's attention is surprisingly funny, partially because of how it isn't played dramatically, as it would in a lot of comedies. It's only after the fact that we learn Tippy imagined it would look cool. It's actually a fairly subtle joke, which is nice. 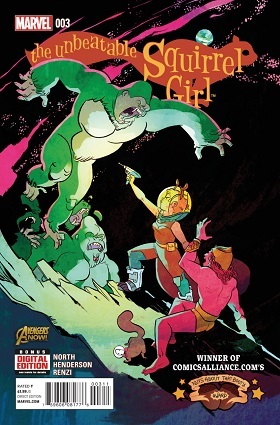 In this third issue, Squirrel Girl must make it to the moon to stop Galactus. Spaceflight, not being a very squirrely power, is not one of Squirrel Girl's skills. So, she decides to "borrow" some of Iron Man's unused suits. In this issue, I'm going to say that it does a good job of explaining Iron Man and Squirrel Girl's relationship, and why Squirrel Girl is able to "borrow" the suits in the first place. However, I may not be the best person to gauge this, as I already know the history between Iron Man and Squirrel Girl; the book does reward people who know Squirrel Girl's history in the comics. 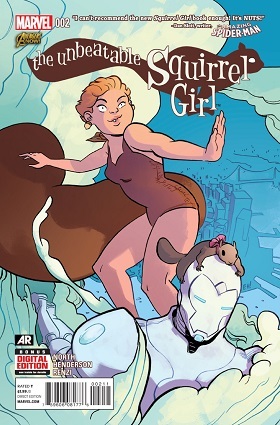 However, seeing as how she is a "cult" character, anyone who is reading the first couple of issues of Squirrel Girl, who is essentially a character with a handful of stories, no upcoming movie, and no previous headlining of a comic book one-shot, never mind ongoing series, is already a part of that "cult", and gets the otherwise obscure references (not that there are a lot; just enough). It's obvious both the two major creatives on the book are fans of the character. 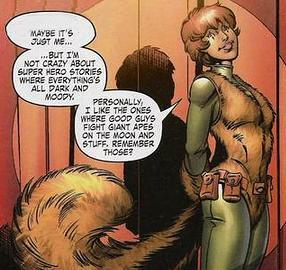 So, yes, I may also be not the right person to gauge a Squirrel Girl book because I really like Squirrel Girl books. But, in counter, I'd say that just means I have high expectations, and to say that this series has so far not just met those expectations, but exceeded them, is pretty high praise. I think there's two flaws; one, what you're describing, in which what is described as "realism" isn't actually very realistic, and, two, when this form of "realism" is assumed to be superior to any other form of storytelling, especially humorous or "fantastic" modes of storytelling.